Enthusiasts of the big blue oval holding out for the Ford Focus ST will be pleased to discover the global hot hatch will cost only $24,495 ($23,700 MSRP + $795 destination) when it arrives at dealers this fall. GTI who? Mazdaspeed what? Ford's already put the Focus square in the middle of a turbo hatch war with its aggressive look, sport-tuned suspension, and EcoBoost 2.0-liter four-cylinder engine. It easily bests the Volkswagen GTI in power with 247 hp and 265 lb-ft of torque, edged out only by the Mazdaspeed3's 263 hp/280 lb-ft.
A leaked spec sheet from FordSTNation.com shows the base price of $24,495, which is $100 less than the four-door GTI (before destination) and $300 less than the MS3 (with destination). Prices do appear to go up precipitously, with various equipment groups (no word on if it's those are final) tacking on an additional $2,505 and $4,840. 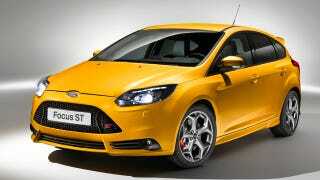 Fully kitted out the Focus ST will fetch in the $29,000 range depending on what each trim level includes. Before you start complaining that you can "buy a V6 Mustang for that much" we'd point out this is for the loaded-to-the-gills ST. And before you start complaining that you could get an FR-S or BRZ for that price we'd also point out that you should stop complaining and start enjoying a world in which someone can pay less than $30K for a new vehicle and choose from a wide array of high performance sports cars.